On 31st January, Xie Ke 5P defeats Zhang Tao 5P by 1.5 point and successfully gets the opportunity of challenging Lian Xiao 9P, the last Tian Yuan title winner, for the title of Tian Yuan. Both Xie Ke and Zhang Tao are the dark horses in this tournament, especially Xie Ke, who defeated Fan Ting Yu 9P and Shi Yue 9P in the quarter final and semi-final. 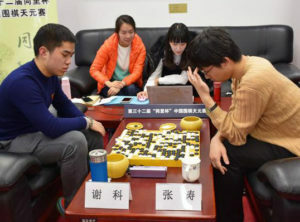 In this game, both of them played really well in the beginning, but Xie Ke makes a mistake in the fight of the mid-game. Zhang Tao successfully seizes the mistake that Xie Ke commits, and build his advantage. But when Zhang plays 131 (here is the game record), which is a slow and losing move, Xie catches this opportunity and successfully reverses the game. The challenging games will play on 10th–13th April in JiangSu TongLi.